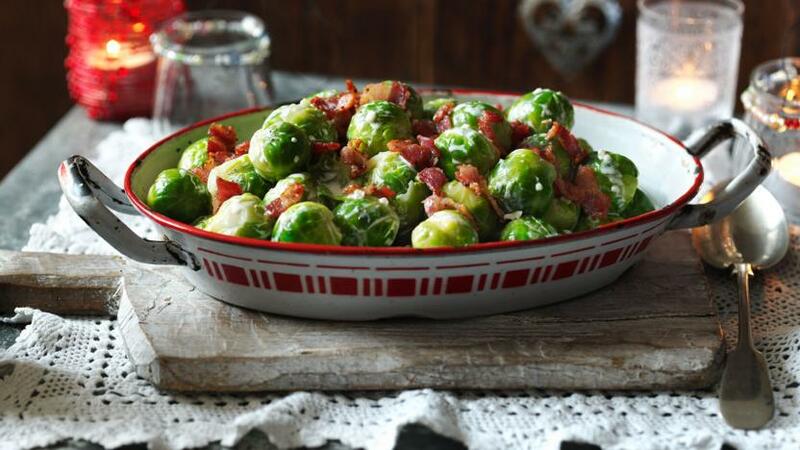 Sprouts with crispy bacon and beautiful garlicky cream will lure in the most stubborn of sprouts haters. Cook the Brussels sprouts in a saucepan of boiling salted water for 8-10 minutes. Drain and refresh in a bowl of ice and water. Drain again when the sprouts have cooled. Add the bacon lardons to a non-stick frying pan, and fry over a medium heat until crisp. Add the cream and crushed garlic to a small pan and bring to the boil. Stir the sprouts into the crisp bacon; then stir in the hot cream. Season with salt and pepper and serve straightaway.